9. Great scene for foodies with more restaurants featuring farm to fork menus and a proliferation of food trucks featuring a wide variety of ethnic menus. Attend any outdoor event in the Triangle and your nose will lead you to the food trucks! Check out the May 2017 Food Truck Rodeo in downtown Raleigh. 10. Stable real estate market. 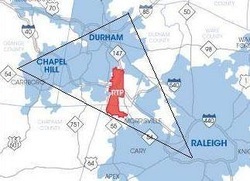 The Triangle like many other areas in the country is experiencing a continued shortage of homes to sell. The average price of a home sold has crossed the $300,000 barrier which is a significant change for this area that has hovered in the mid $200s for a decade. Appreciation compared to 2016 has accelerated to 6% eclipsing the steady but sure 3.5% per year that the Triangle experienced for years.